Here are few tips how to create and run ASP.NET Core application under Linux (Ubuntu 14.04 LTS), on a cheap Azure VM (0.75GB RAM, 0.25 CPU cores). Windows Server requires a little bit more memory (way around that is to increase the size while you're configuring the machine, and then lower it while not working in RDP). TIP: to use bash and ssh from windows, there are few options: new native Bash on Win10, Git bash, or putty. They all have ssh. So please, go ahead, follow those simple steps, I'll wait here. open VM blade, Settings, Network Interface, Settings, Network Security Group, Settings, Inbound Security Rules. There, add rule for destination port 3389. Also, it's useful to assign DNS name to that machine, to avoid using dynamic IP address. You should be able to RDP into the machine now! First time I got some error with "connection error", but I tried again immediately, and was able to RDP and log in into XFCE. Geany text editor (in terminal type sudo apt-get install geany. It will be installed under /usr/bin folder. If you navigate there with file browser, you can right click to it and choose Send To/Desktop Create Link). Btw, don’t expect code completion, it's just syntax highlighting. And if you feel brave enough, there’s always VIM. Purpose of installing text editor is not to develop an app on web server, but just to edit configuration files! To create new asp.net app, follow this: https://aspnet-aspnet.readthedocs-hosted.com/en/latest/getting-started.html . Geany text editor can be used now to edit project.json and CS files (or Nano from bash). Check for namespaces when copy-pasting from tutorial, it's probably different from the one created by dotnet new. Executing dotnet run will start Kestel, and sample page can be opened in Midori! Happy days! 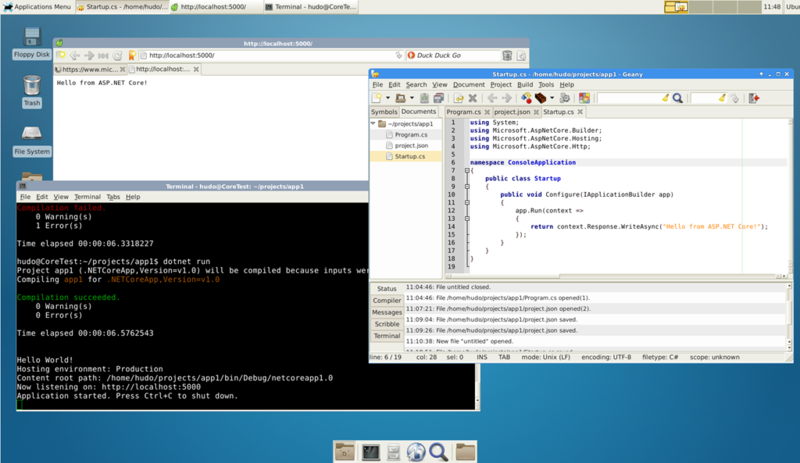 XFCE running with Midori, Kestrel, Geany takes around 70% of 0.75GB RAM, which is OK for playing with new dotnet and even running small-medium websites in production.